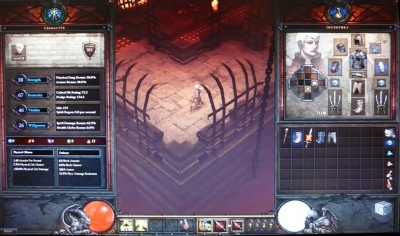 The "belt" interface in Diablo III is an evolutionary improvement on the versions seen in Diablo I and Diablo II. The form and function will be familiar to players experienced in the other games, but there are a few major changes in Diablo III that make the controls easier to use, but also guide players to operate the game as the D3 Team intends. It's no longer actually the "belt," since belts in Diablo III are just another piece of armor; they do not have any special role as potion-holding devices. See the Interface Category for articles on the game controls, menus, inventory, and more. The most recent interface overhaul: added TP button, dedicated potion button, removed Character window. Beta patch 10, January 2012. A Wizard's Interface, October 2010. The way the controls work has been modified somewhat in Diablo 3. The usual control method is to put active skills, ones your character will be using constantly, on the mouse buttons. The left mouse button (LMB) skill remains there all the time, unless/until you drag another skill down to replace it. The right mouse button (RMB) has two skills; you switch between them by clicking the Tab button, or by rolling the mouse wheel. These are usually the secondary skills, but ones you wish to use almost constantly. The visual aspect of the Tab skill was removed in mid-2011 though the function was preserved at that point. The 1234 buttons cast whichever skills are mapped to those buttons, targeting the spell for where the cursor is pointing, just like a mouse click. These are generally summoning or buff skills, but can also be direct attack skills. You may also map potions, elixirs, or scrolls to the 1234 buttons. The 5 slot holds healing potions. If you use up all of one quality level, any other healing pots in your inventory will automatically fill the 5-slot. Casting a spell or skill from the 1234 buttons works just like casting it from the mouse button. You could, in theory, play entirely with the 1234 keys, only using the mouse to target. Generally, players put support skills on the 1234 buttons. Summoning spells, buffs, debuffs, and so forth. Direct attack skills can be mapped there as well; it just takes some practice to get used to casting these with keyboard buttons, instead of (in addition to) the mouse buttons. Debuff icons appear on the right. A fan suggested an "always move" button via the European B.net forums, and the idea was good enough that the developers decided to implement it into the game. It will not be in the initial launch, but will be added in a patch afterwards. The way this control will work is that the player can depress some key (much as the Shift key is used to repeatedly swing/attack without moving) and while holding that down, they will always move when they left click, even if they have a target highlighted. The reason such a button is useful is for characters who map a ranged attack to their left click. (Especially for Wizards in Diablo III who have a Wand equipped, as the Throw Wand skill is then the default left click.) This is a problem if the player needs to run in a direction, since with a ranged skill on the left click, if anything is targeted the character will stop running and stand there, firing the spell. This can be very bad if a player is trying to escape monsters on a crowded screen. Character and Inventory windows, Blizzcon 2010. Mapping skills to the controls is very easy in Diablo 3. You just open the skill tree and drag skills down to the buttons you wish them assigned to. To change around skills, you drag a new one to an occupied slot (RMB, LMB, Tab, or 1234) and drop it. This puts the previous skill on your cursor, where you can drag it to a new spot or drop it anywhere else to discard it. In late 2009 Blizzard revealed that the entire skill tree design had been redesigned and that skill trees were now basically a thing of the past. The skills and traits are now presented in long lists, rather than any kind of branching, prerequisite "tree" design. See the skill tree page for more details on this evolving element of the game interface. In addition to the skill tree, there's an icon that opens the "active skills window." This is a small pop up window that appears just above the belt interface, which displays the icons for the active skills your character can use. Only the active skills; no passives, no skills without points in them yet, etc. This makes it very easy to see which skills can be assigned to the 7 skill places on the belt. There are 5 hotkey slots, into which skill icons or potions can be dragged. Hitting that button will immediately activate that skill or drink that potion. By default, the skill slots on the Belt Interface are mapped to the number keys 1-4 and "Q" is used for potions. Any skill placed in one of those slots will be cast the moment you press the corresponding key. The left click and right click slots are marked by an appropriate little mouse icon. The "Tab" key (and the mouse wheel) switches between two active skills on the right click. Skills are added to these controls by dragging them to the belt interface from the skill list. Newly-added skills are automatically added to the hotkey list, once you've put the first point into them. The Skilltree Menu icon can be seen atop the skill tree in various screenshots). The Quest icon is a chalice, presumably meant to represent the perpetually quested after mythical Holy Grail. It's not entirely clear what the party menu does, since there is no friendly/neutral/hostile setting in Diablo III, with the removal of non-consensual PvP. Perhaps it exists to show where other players are, or to allow whispering or squelching. This page was last edited on 2 December 2012, at 15:45.